MailEnable provides hosting providers or ISPs with a solid email platform that provides all of the required features at a reasonable price. MailEnable generates cost savings by reducing both hardware expenditure and downtime, and most significantly, by providing a flexible licensing model. There is no per-seat licensing on any product. MailEnable allows you to host unlimited domains and users. The license is provided per server on a perpetual basis for a major version. Even as your business grows, the cost of your licensing remains the same. Administration is a necessary cost of operating MailEnable, or any mail server. MailEnable is designed in such a way to reduce the amount of time systems administrators spend managing the mail server. By providing the necessary tools and resources to support systems administrators, the system can be managed efficiently and productively. The mail server or even clusters can be configured and maintained remotely from anywhere with an Internet connection, via remote administration. A new statistics module provides detailed statistics on all mail services (POP, SMTP, IMAP). Reports can be customised to suit the users reporting requirements. MailEnable can allocate quota limits to users or domains and can automatically inform users who are over quota. Message throughput can be restricted by mailbox or post office to help prevent spamming through the mail server. Rules can be configured globally to control your mail content, run applications, forward mail and much more. Users can also individually configure filters to perform a wide variety of actions - configure filters to quarantine, move or delete messages based on content. Centrally, you can delegate admin rights to a post office administrator to manage their own configurations. Mailbox clean-up agents can be set to operate at set intervals to clean up specific folders within specific post offices or domains. MailEnable allows clustering and storing configuration data in Microsoft SQL/MySQL. The system only stores server specific configuration data in the registry of the local machine. This effectively means that you can install multiple server nodes and point them at the same storage repository. By load balancing and clustering Front-End Servers (IIS, SMTP/POP, IMAP) the system can effectively scale out very easily. MailEnable's open and modular architecture and service isolation promotes maximum uptime because the system is comprised of different logical processes. For example, if one service should fail, other services are not necessarily affected. MailEnable provides a secure messaging platform to safeguard your system against unauthorized access and unsolicited mail or viruses. Authentication methods such as CRAM MD5, NTLM, and advanced relay settings control access to your mail server. Accounts can be locked out after too many failed attempts to prevent an unauthorized user from gaining access to the system. MailEnable employs several methods of blocking or filtering spam, to effectively reduce the amount of junk mail received by the user or the mail system. MailEnable features message and content filtering, greylists/whitelists, allow/block lists, SPF, auto-training Bayesian filtering and several other features for stopping unwanted emails being delivered. To protect your system from viruses, MailEnable integrates with a variety of Anti-virus solutions in order to scan for viruses on all incoming or outgoing messages. 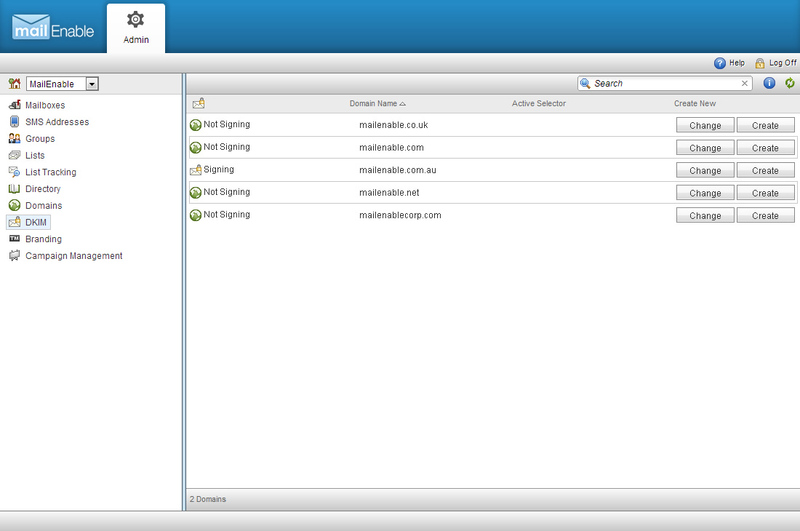 MailEnable gives you the ability to configure settings by mailbox (user) or by post office (domain/s). In an email-hosting environment, this allows the flexibility to restrict certain features for users and charge extra for access to additional features. For example, you can choose which mail services are enabled for each user or mailbox (e.g. POP, SMTP, IMAP, Webmail) and you may charge extra for users who want the added functionality of these services. Similarly, other features such as anti-virus, can be managed in this way. MailEnable allows you to customize Webmail on a per domain basis. This means you can change the look and feel of Webmail - each company you host may have a different corporate Webmail skin. MailEnable integrates with several third party applications to enhance the mail features that you offer to your customers. Antivirus products MailEnable allows you to scan all incoming and outgoing mail using a range of third party command line anti-virus scanners. 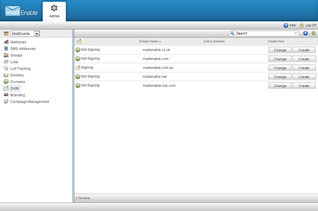 Control Panel Software MailEnable integrates with several control panels including Plesk, WebsitePanel and HostingController.